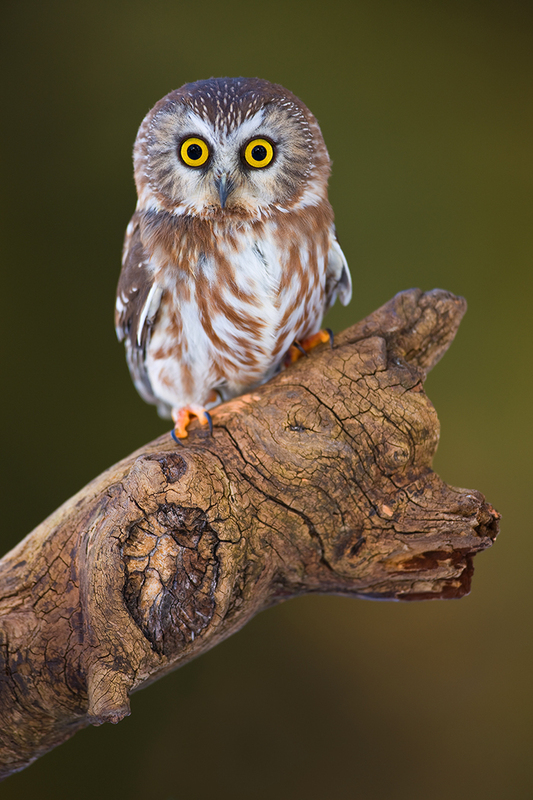 The average Northern Saw-whet Owl (Aegolius acadicus) weighs a mere 5 ounces at maturity, and sports a full wingspan of 16-19 inches. This woodland resident is a night hunter, and a very effective "sit and wait" predator, swooping from low perches, silently and quickly to catch its unsuspecting prey. Their instinctive defensive posture, when feeling endangered or discovered, is to sit very still and not fly. Often people will mistake their demeanor for being tame, but that is far from the truth. This mature saw-whet is beautifully demonstrating how they can look so tame and gentle, when in reality they are really frozen in place, hoping that if they don't move a feather, we will just go away.